Content marketing has become one of the most powerful digital marketing strategies for businesses of all sizes and industries. However, when it comes down to developing your strategy, it can be difficult to decide which types of content marketing you want to use to grow your business. Below, we’ll discuss the top 10 high-performing types of content marketing and how your business can use each format to engage your leads and boost sales. Don’t have time to read this blog post? Make a phone call instead and schedule it on your own time. Chat with our team to learn what types of content marketing we offer are best for your content marketing strategy. Blogging is one of the most popular types of content marketing for small businesses. And for good reason! Blogs are one of the best ways to improve SEO and drive more organic traffic to your site from the search engines. This can help you make the most of your limited marketing budget by supplementing any advertising with inbound content. In fact, according to Forbes, websites that include a blog typically have 434% more indexed pages than those that don’t. This means that sites with blogs have a greater chance of ending up on the first page of search engines like Google when consumers search for relevant keywords. Additionally, business sites with blogs have 97% more inbound links, which also helps with search engine optimization. As you can see from the graphic above, there are a variety of benefits for businesses that blog regularly. Not only does blogging help improve your search engine optimization, but it’s also a great way to build relationships with your leads and current customers. The more valuable content you provide, the more likely your target audience will be to consider your brand when they are ready to purchase. Blogs are an effective way to provide value through short-form content. If you want to use blogging to improve your content marketing and grow your business, you’ll need to start with a strategy that includes which topics you plan to cover in your blog. Do some keyword research to see what consumers are typing into the search engines to find brands like yours. Then, consider what other topics or questions might be relevant and create blog content around these topics. If you want to remain competitive in the busy digital marketplace, it’s vital that you find a way to grab your target audience’s attention and engage them quickly. Consumers today are viewing more video content than ever before. In fact, one-third of all online activity is spent watching video content. This fact makes video one of the best types of content marketing for reaching and engaging your target consumers, no matter what industry you are in. Video is a great content marketing tactic for small businesses because it provides such an appealing return on investment. According to BrightCove, brands that use video can expect to see an average increase of 157% in organic traffic from search engines. Video also helps increase time spent on site by 105%. The more time your customers spend on your website, the greater your company’s chances of making a sale. When it comes down to it, you just can’t ignore the power of valuable video content. If you’d like to harness the power of video you will need to consider what types of content and topics will appeal to your audience most. This will ultimately depend on where your audience is in the buyer’s journey. Short and attention-grabbing informational videos can help you engage consumers in the awareness stage. While how-to videos and product demos are great for influencing purchasing decisions among consumers in the decision stages. This infographic explains different elements of carpet cleaning that consumers need to be aware of. Notice that the infographic is branded with NY Brite’s logo. In this example, the cleaning company is educating its audience about different factors involved with carpet cleaning while simultaneously explaining the benefits of hiring a professional carpet cleaner. The infographic also uses eye-catching visuals that are relevant to the topic and make it easier for the viewer to understand the information that’s presented. If your business chooses to use infographics to attract and engage your audience, consider which topics are best suited for this format. Typically, any information that would benefit from a visual aid can make an excellent infographic topic. You can use infographics to explain a complicated subject, present statistics that help others understand the value of what your business provides, or even offer a diagram of your product. If you’re interested in producing more infographics for your business, contact us to learn more about how our team of talented designers can help. Another one of the most valuable types of content marketing is the case study. Case studies are basically customer stories that illustrate how your business has helped a specific client or customer become successful. Businesses can use case studies to highlight special applications or uses for their services and products. Consumers like case studies because this type of content helps them better understand how your brand can add value in their lives or businesses. Though you can provide general applications or uses for your products or services, a real-life example is often more valuable as it helps your business build trust with new leads. Case studies are effective because they help leads better understand how your business can help them. If you plan to use case studies as part of your content marketing, it’s important that you carefully consider which of your customers you ask to serve as a case study example. Strategically choose those customers who your products or services have benefited in a significant way. You also want to work with customers or clients who are willing to provide not only their permission to be used as the subject of the case study but also some quotes and statistics that illustrate how your business has helped them succeed. Case studies can be housed on your company website, but you may also want to use them in other ways. You can use case study examples in your blogs, eBooks, social posts and other types of content. Your sales team may also want to use these pieces of content when talking with leads. For instance, if the new lead has similar characteristics of a past customer who is featured in a case study, then the sales person may want to provide the lead with the case study so that they can better understand the value your business might provide. eBooks are an effective type of long-form content that businesses can use to provide value for their leads and customers. The keyword here is value. Your eBook should not be a 5 to 10 page ad. Instead, it should provide some type of useful information and insight for your target audience about their needs and challenges. Like many other types of content marketing, it’s not about selling to your audience, it’s about building a relationship with target consumers so that they trust your brand and come to you when they’re ready to make a purchase. eBooks are one of the best types of content marketing for collecting lead information. That’s because they are typically gated, which means that visitors must provide some type of information about themselves in exchange for the eBook download. This is an example of what our digital marketing eBook promotion looks like on a our site. It’s important to note that eBooks require a bit more of an investment than some other types of content marketing like blogs or social posts. They are longer and more involved to create. However, don’t let this scare you off from creating an effective eBook. The leads that you will generate through this piece of gated content will provide an attractive return on investment that will make any time or money you invest into the project worthwhile in the end. White papers are similar to eBooks in a lot of ways. The whitepaper is another type of long-form content that can be effective as a lead magnet. However, the main difference between eBooks and white papers is that white papers tend to be a bit more information-dense, data-driven, and detail-focused. This makes whitepapers one of the best types of content marketing for B2B and other small businesses that want to build thought leadership and gain more respect in their industry. One of the greatest benefits of white papers is that they can help your small business gather information about new leads. According to a 2017 DemandGen report, 76% of buyers surveyed said they were willing to share information about themselves with a business in exchange for a white paper. This information that consumers share with your business not only gives you better insight into your target audience but provides a way for you to keep in touch with a lead long after they have downloaded the content. Your whitepaper can be a piece of gated content that requires the lead to provide information about themselves before they download the content. Notice that the landing page content was created specifically for this white paper download. The landing page tells the reader what they can expect to get from the piece of content. While the lead form asks for information that will help the company better understand who the lead is and what they might need. Checklists are a type of worksheet that provide a list of things to do in a step-by-step process in order to achieve some type of desired outcome. These are great content assets for small businesses because they are easy to create and promote, yet still provide a significant value for the target audience. This checklist from One Hour Heating & Air Conditioning provides homeowners with valuable information they need to make smarter decisions about their HVAC service. The checklist above provides a list of actions that homeowners should take regarding their HVAC system. The checklist is easy to read and follow, and it provides valuable information to help the company’s target audience make smarter decisions about their HVAC maintenance. This is a great example of what a checklist should be as it focuses on providing value for the reader. After you’ve created a checklist on a relevant topic, you can share your checklists on social media or even incorporate them into a blog post. The more you share and repurpose your checklist content, the more value your business gets out of the investment. Interviews with industry experts or even your own customers are another one of the most high-performing types of content marketing. Interview content provides valuable information for your site visitors that can help them better understand their challenges and needs. Not to mention, it is a great way to position your company as an expert in the industry. Here is an example of an organization using an interview with an expert to provide valuable information for their target audience. Host a live interview through a webinar or live stream like Facebook Live. Record interview content and make it available on your site and through YouTube. Create written interview content on your blog. Seek out opportunities to be interviewed by third-party sources. The key to leveraging interview content is making sure that the material will provide some type of value for your target audience. Choose interview subjects that can offer useful insight and information on the topics that matter most to your leads and customers. At this point, it’s no longer a secret that small businesses can harness the power of social media to reach their target audiences. Social media platforms like Facebook, Twitter, and Instagram help businesses reach new audiences and nurture relationships with customers. The content of your social media posts play an important role in how your company engages new leads and existing customers. How you use social media posts as part of your content marketing strategy will depend on what your goals are. When it comes to conversions, there are a few different ways that the various social media channels can be used to influence your target market’s purchasing decisions. Social media posts can be used to help new leads discover your products, alert consumers to sales and promotions, and provide leads and customers with additional information about your products. There are many different ways that social media posts can help influence a customer’s purchasing decision. Though social media content can be used to directly influence a purchase, it’s also important to remember that social media is one of the best types of content marketing for lead nurturing. You can use social media posts to start a conversation with consumers and engage your target audience. Make sure that you have a mix of promotional and informational content across your social media channels. It seems like everywhere you turn, someone is sharing one of their favorite memes. These types of content have become extremely popular among consumers and have solidified their importance in popular culture. Not to mention, memes and GIFs are some of the most shareable types of content marketing on the web today. I mean, it’s true. One does NOT simply get to the top of Google… without great content, that is! This GIF features the character Napoleon from the film, Napoleon Dynamite showing his moves on stage. Businesses can take advantage of these familiar and popular content formats by using GIFs and memes to bring excitement or draw attention to a topic. You can create your own GIFs and memes or find relevant ones that are already floating around the internet to grab your audience’s attention and get them interested in what you have to say. There a few different places that you can use these types of content marketing in your own strategy. For instance, you can include GIFs or memes within blog content or marketing emails to keep readers entertained. You can also post them on social media as a way to generate conversation about a particular topic. Not to mention, GIFs and memes are also some of the most widely shared types of content on the internet today, which means that using these content formats may even help you gain greater visibility within your target market. Still not sure which types of content marketing are right for your business? Fortunately, you don’t have to go at it alone. 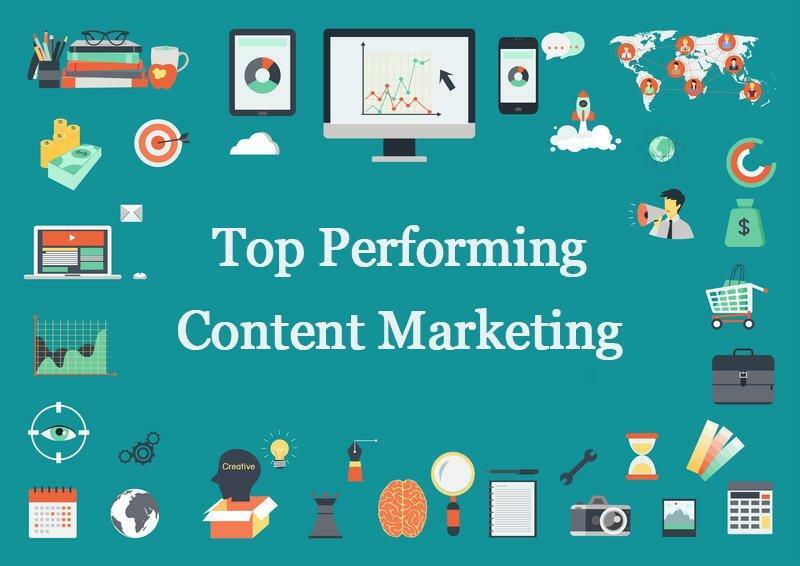 Our content marketing experts at LYFE Marketing love helping businesses just like yours develop and implement effective content marketing that helps you connect with your leads and improve conversions. Want to learn more? Read all about our content marketing services to decide if partnering with LYFE Marketing is the right decision for your business. Do you have other ideas on types of content marketing that have helped your small business? Share them with us in the comments below!